It is now the Christmas break and I've got a bit of time on my hands. I have been bugged for some time by the fact that my Davis Vantage Pro 2 Wireless weather station is not very hacker friendly. Maybe it is time to change that. It is out of warranty now and I decided to open it up to see what makes this thing tick. This is the guts of the VP2 Wireless Console. The controller board is on the left and the display to the right. 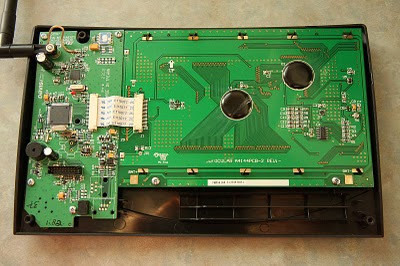 The controller board PCB is just double-sided, and contains contact pads for the buttons on the other side. The bottom part of the unit is where the batteries normally go. There are just three screws holding the back on and it comes off pretty easily. One thing you'll want to do before trying this is to put the console into config mode by hitting the Done button and then Down Arrow. According to the manual, this ensures that the unit isn't trying to write to flash before it loses power. And it will lose power. The AC adapter has to be pulled before the back can come off, and the batteries make connection to the main board with just a couple of clips rather than a set of wires. Losing power is no big deal though: the unit remembers its settings once power is restored again. Nice. The first thing I noticed is that the CPU is an Atmel ATMEGA 128L running at 1.8432 MHz. I was afraid it might have some kind of a custom processor or something to keep power consumption low. 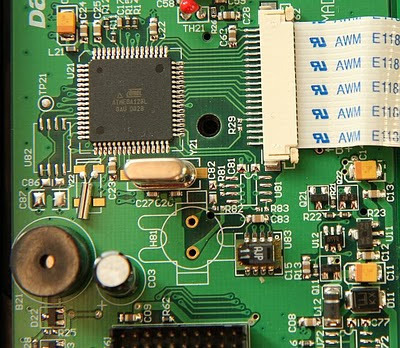 But you don't get more common than an ATMEGA chip, and there are a lot of freely available tools out there that should simplify digging into this. Oh, you and I are going to get to know each other a lot better soon. The second thing I noticed was the radio transceiver chip. Again, I feared something custom here. But it turns out that this is a CC1021 from Texas Instruments (data sheet). TI describes it as a "true single-chip UHF transceiver designed for very low power and very low voltage wireless applications." Sounds about right. Hanging off of it is a 833 MHz crystal. Anywhere I've read about people trying to decode the transmissions from the station were always put off by Davis' "frequency hopping spread spectrum" advertising. This is much more advanced than the old FSK method they used. But hey, if you know the transceiver and you know how it is set up, then that opens up some interesting possibilities. You don't scare me. I do RF all day at work. The one thing I don't care about much is the LCD. It is apparently a custom unit built by Ocular LCD labeled A4144PCB-2. It doesn't appear on their website (that I could find after 20 seconds of looking anyway). build a standalone receiver around a CC1021 and something like an Arduino. This would give me a low cost receiver with a proper computer interface. Some pretty cool possibilities here. PS. If anybody knows what this is, please leave a comment. It may be a MEMS pressure sensor. I think you might be right. I had been thinking for a while that it might be an RF switch of some kind supporting the console's retransmit function, but the connectivity isn't there in the circuit. Your idea makes more sense, combined with some other pictures I have here. Nice. I wonder if the main board in the console is the same ones used in the Envoy's. Being that the display is connected separately, it seems that might be possible. The chip in question is more than likely the barometer transducer (just an absolute pressure gauge). SHT1x.pdf Humidity Sensor Datasheet Sparkfun.com sells them. 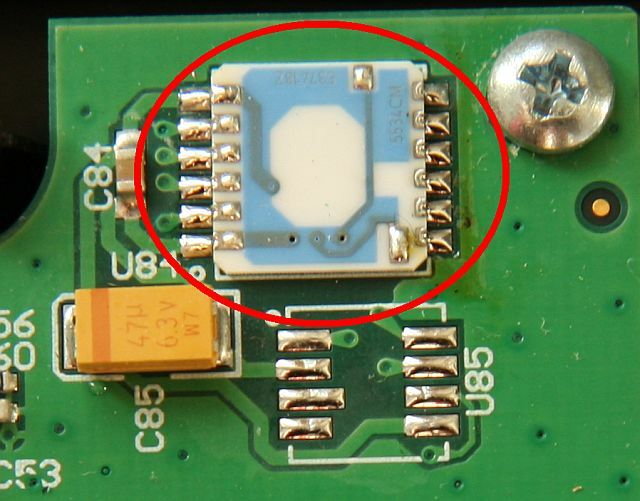 It also looks like there is a thermistor below the crystal on the transceiver. Heh. Had to find this out for myself, only to find afterward that Blogger had marked your post as spam. Wrote a new post with a few more details on the subject. The board is the same as the Weather Envoys, just with different firmware so that it doesn't get upset when it doesn't see the display. I used to service these as a uk service agent. Anonymous, that's very interesting. Thanks for pointing that out. Yes, thanks anonymous! Thanks indeed! is it possible to change th quartz of the tranceiver that the us console work withh EU ISS ? @keving: I learned since I wrote this that the crystal is actually 14.7456 MHz. The frequency is multiplied up internally in the CC1021 to the appropriate band. 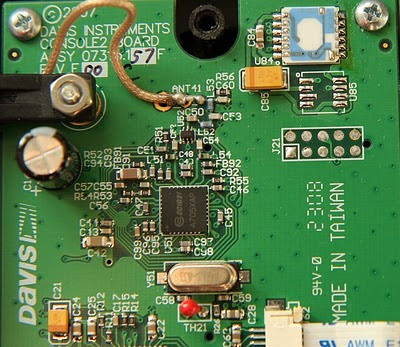 My guess is that the only difference between the US and EU versions is firmware, but Davis *might* also have tweaked the components in the RF section around the CC1021 for better operation in that band. Thanks Dekay for your answer, did you have tips for translating the firmware of the vp2 console (for displaying console's messages in french ) ? What soft un recommended for editing the fimware (.bin file) ? Thanks, did you know any solution for udating the console firmware without the davis console updater ? Nope. And for reasons I don't yet understand, the Davis console updater (or any other Davis software) doesn't work with my DIY interface, but every other piece of software does. Not sure if it is my OS (Vista x64) or the interface itself. ok, it is easy to bluid a diy Davis Console updater ? The CC1170 868 MHz and 915 MHz reference designs are equal. There are no difference in terms of component values. To make your 915 MHz design work at 868 MHz you simply change the register settings that sets the operating frequency (registers FREQ2, 1, 0). You get the register settings from SmartRF Studio. Did you find a way to manage that? Hi, do you know if there is a way to mod atmel firmware to change frequency? hi, i really appreciate your work. but did you manage to hack the actual raw data from the davis weather station itself? what im planning is to interface the weather station [without the console] to my datalogger. thanks and keep up the good work..
My ISS is wireless and I am playing with receiving its transmissions with a separate receiver (http://madscientistlabs.blogspot.com/2012/01/im-me-proof-of-life.html). I've never played around with the wired ISS if that is what you mean. I have a wired ISS and I have played around with the protocol a bit a few years back. Davis does, or at least, did sell the instrument package as a seperate assembly. I am a ham radio operator and at that time I was trying to set up APRS weather stations around the area, I did not want or need the disply and certainly did not want to spend the close to 1k that Davis wanted for something that would smooze the data the way I needed. I got as far as finding the data is asynch serial, it is sent as a differential signal (easy to convert) and that 7 bytes are sent every 2 seconds, that the first (or seoond, working from memory here) is the wind speed, that the last is a checksum and the the ones inbetween somehow relate to termperature and humidity. I recall the humidity one was straighforward, the temperature seemed deliberately disguised. I believe this is the protocol the poster above is asking about. I am also very interested in this if anyone has cracked it. If anyone is working on this or has cracked this egg I can be reached at nd0b@arrl.net. So much for anonymity. I know Im a bit late to the party, but your mystery component looks a lot like a barometric sensor I have used before. Hi guys, I am thinking of converting my wireless VP2 to wired. Have a wired console, and the connecting cable with RJ11 plugs. I disconnected battery and solar panel from the ISS, and plugged the cable end into the COMMS socket, but no data shown on console. Is it possible to do this, or is a completely different PCB needed. The wireless one has the socket for the cable connection. Thanks. Hi,some awesome work you've done! I just got a VP2 weather station. Not the wireless version. So basically the output from VP2 is from a RJ11 jack on the board. Do you mind helping me understanding what's the output and pins are like on the RJ11 jack. I really appreciate if you can.Would like to read the data on a microcontroller. I don't have a wired VP2. This is where Google comes in handy. Thank you for your reply, yeah i've googled about it and that's how i got to know your site. But its hard to find the specific thing that i need to know. I guess my googling skill is not that great. Thanks for the links its a great help. I've learned some new information about the ISS that I've bought. It is not the normal ISS. The board on ISS is some other type that is compatible with eko pro node. From what I've searched the communication seems like it is using memsic esb protocol. Right now I'm searching how the protocol works. does anyone craked the cabled iss protocol? I bought a Davis weather station last month for my Mom but it seems the quality of the item is not worthy for the price. I returned my weather station back to them and got my money back. So I would like to recommend you the weather station I bought a year ago from eBay, this weather station is still working and I am happy with it, the cost of the item is very cheap, but the quality is really good. You guys should try this also. I purchased DAVIS Vantage 6152 US version but have to send it to my family in Europe. I checked Davis website about a FW that will convert my US station to EU version. Unfortunately, this doesn't help, they have only one Firmware for all their models. Obviously, there is one same FW for all the versions and the unit run the FW in dependence on a hardware difference defineing the station type US, EU and etc..
John, sorry for the late reply. Check this link out. I have a Vantage Pro2 and it looks that I have a faulty circuit board. When I power up the board, the diode marked “D11” gets really hot. The screen looks like working, all the icons are ok at reset but it cannot get readings from the sensors. Sounds like a short circuit or faulty component pulling a lot of load. Could be many different things. What about Oregon Scientific RGR126N someone use it? It work's good? I recently got involved with a VP2 FW rev 1.8.